Doing the Camino de Santiago alone, is it advisable? 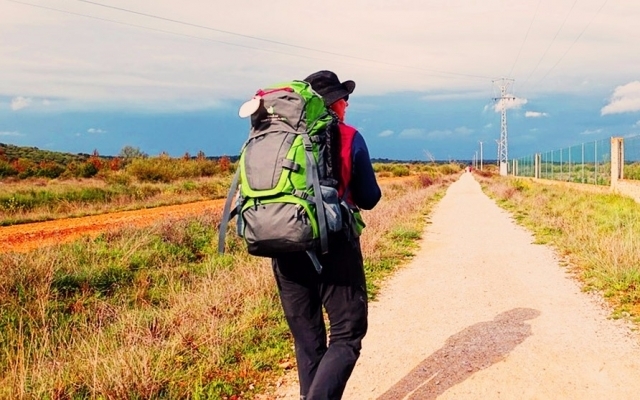 For some reason or other many pilgrims ask this question every year: What advantages and disadvantages we'll find doing the Camino de Santiago alone? It is a recurring question: "I want to do the Camino de Santiago but did not agree on dates with family / friends Is it right to do it by myself?" Or on the other hand, "I want to live the experience alone and meet new people Will I be bored? We will try to answer some of these questions, away from clichés and always having clear that although the entire atmosphere on the Camino is excellent, no one is safe from a bad spot experience. If you're considering starting to use the road without company, we can give you several reasons to decide you positively; every day there are many testimonies of pilgrims who come to us with very positive experiences behind, and not a few of those cases come from people who were able to overcome their initial doubts and were encouraged to travel alone. Like everything in life, experience that we'll find depends on each of us, what we go looking and our own personality; something positive because both if we meet new people that share group stage as if we prefer to walk alone, the Way will suit us. Fear and uncertainty to plan a trip of a week or 10 days walking paths unknown and doing stop every night in a different place is perfectly normal, but once you decide and take the first step of your way find yourself quickly with the reality is that the conditions of the Camino de Santiago favor and much a great atmosphere of camaraderie among the pilgrims, and it is normal that if your predisposition on the trip is open not delay to engage with people walking by your side. Therefore loneliness as we had anticipated when planning the trip becomes something quite different; quickly we discover the ease of meeting new people, walking accompanied in some stages and go forward on our own when we feel like to be alone, to think and live the Camino in a different way. It's easier than you think to spend toggle the company with loneliness on the road, without understanding loneliness as a negative, if not the opposite. On the other hand, other reasonable doubts may arise before we decide to travel alone, how dangerous? If I lose I am at a disadvantage to go in a group? The truth is that although in recent years we have known cases of attacks on the Camino de Santiago, the general climate is security, fraternity and hospitality, something that does not change whether we go in groups or alone. Kindness both among the people of the Way, as other pilgrims or personnel shelters, etc. is the general tone and predisposition to indicate an address, give us information or advice is high. As for security, it is not something we have to worry too much, except in very crowded areas or stages by pilgrims, where an oversight can be exploited by an isolated offender to take any backpack, briefcase, etc. Whether alone as accompanied, always keep your belongings in areas controlled more pilgrims than usual you go. In short, if you you're still considering we want to encourage you; don't be afraid to make the Camino for yourself. If you have been forced to travel alone because you could not find anyone around you to accompany you, make that point circumstances an opportunity and take advantage of the trip to live the Camino to 100% and meet you in a deeper way same besides letting meet other pilgrims to enrich your experience. Lanzarte to live an experience like the Way should not be slowed by circumstances or the availability of people in your environment; Way accepts everyone equally and never puts a requirement traveling companion.